Designer Brassware: envisioned by Kelly Hoppen, created by Crosswater. Kelly Hoppen is a renowned name in the interior Design world, and now increasingly so in the consciousness of the general public, with Kelly’s appearances on popular programs such as Dragons Den, and interior Design series ‘Superior Interiors’. Creating chic, sleek interiors Kelly Hoppen’s designs are timelessly elegant and her style is highly coveted. Key notes are upscaled decorative accessories (think large scale vases and lamps), which create a sense of space and luxury, combined with a more paired back colour pallet and luxurious materials and surfaces. 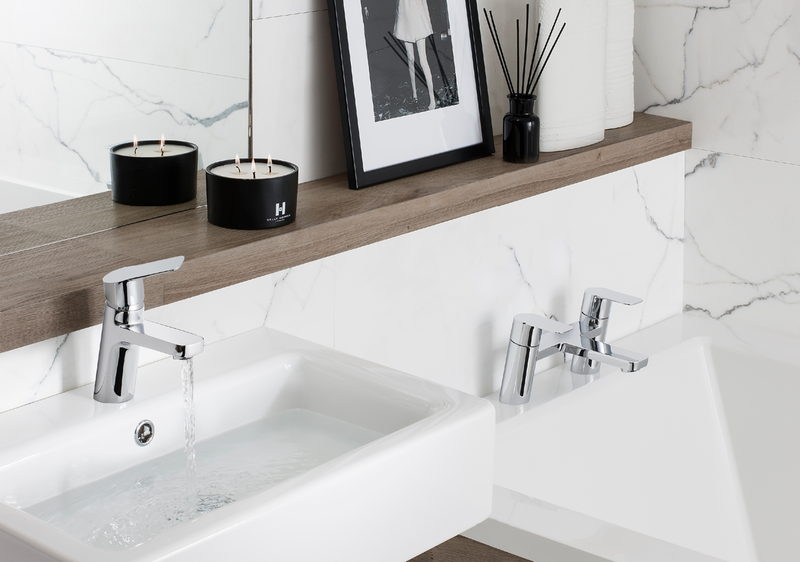 In 2013 Crosswater, one of the UK’s most popular brassware brand names and Kelly Hoppen teamed up to produce a range of fashionably stylised and lustrous coordinating mixer taps, showers and mixers. The first range was dubbed: KH Zero 1. These products were welcomed into the market with continued success and interest. The popularity of these has seen a further 5 ranges launched. This design range fuses together squared edge, ample-feeling tap bodies with slimmer curved spout designs that feature very sculptural negative spaces. The matching shower valve plates combine the same mix of squared back face plates, with round handle blocks and slim, curved levers. The handles add a lovely functional element, with comfortable smooth action technology and premium quality you would expect from Crosswater. The Zero 2 range features rounded solid tap bodies with elongated, sophisticated thin lever handles, following the form of the spout. Modern and chic, these pivot on a smooth joint to control both temperature and flow in one action. The cleverly designed, slim handles are the main showpiece feature of these taps. Coordinating bath and basin versions with minimal ceramicware would create a softly serene, sophisticated bathroom space with a spa feel. Zero 3 has a well designed, thin handle on a pivot similar in fashion to the Zero 2, but with a completely different overall aesthetic. Boldly geometric, with crisp 90 degree angles and squared off corners the Zero 3 evokes a more architectural taste with strong, straight lines and corners. You could pair these with black basins, polished concrete floors, geometric tiles, and a bespoke smoked glass wetroom screen for a look right out of the most exclusive interior design magazine of the moment. Next is Zero 5, with a completely different feel again. This is a single kitchen tap, with a subtlety traditional design, featuring decorative fluted nozzle and base detail. Combine this kitchen mixer with a Belfast Sink for a beautiful timeless look. Last but not least is Zero 6, an edgier range with a nice contemporary twist. The forward angled tap bodies add a sense of movement and energy. The slim handles are light and smoothly operated adding to the overall dynamic, a pleasure to operate. Overall you have a great choice on offer here, with varying designs that can be incorporated into a wide range of interior design plans for all kind of bathroom spaces. Remember to come back to ukBathrooms.com to place your Kelly Hoppen brassware order, we can have these delivered to you in 3 to 5 working days ready to install in your new bathroom!